Airtel, country’s largest mobile operator introduces unlimited sms pack for all circles, for prepaid and postpaid subscribers. 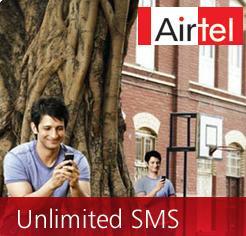 With Airtel you can enjoy unlimited SMSing anytime and anywhere in India from your home circle. But there is a Fair Usage Policy(FUP) of 500 local and national sms per day. In some circles Airtel is offering upto 750 sms per day at a nominal cost. PostPaid users can enjoy unlimited National & Local SMS (upto 500 SMS* per day) at a monthly rental of Rs. 99. To activate sms pack, sms UNLIMITED to 121. Note that on SMS Blackout days, these free sms will not be applicable and these days local & national sms will be charged at Re1 and Rs 1.50 respectively.Though this is Airtel’s answer to SMS tariff war started by Reliance Communications, still Airtel’s sms pack can’t beat Reliance’s SMS packs – which offers pan India 500 SMS/day at just Rs 25 for 30 days and applicable in home and roaming. Please request to SMS job I am permanent airtel tellicaller pls try in the job thank you.